When people ask me how I’ve lost weight, besides Weight Watchers, I tell them Tupperware. Say what? My beginnings with Weight Watchers began when I was introduced to it by my aunt. She was loaned some Weight Watchers books from one of her clients and then she lent the books to me so I could look them over. As with a lot of other weight advice she gave me, I listened but it just didn’t really click. In truth, it clicked but unless she was sucking my fat out with a vacuum and it did not involve changing my food and exercise I wasn’t going to hear it. As I said before, we have to want help and I didn’t want it yet. All in God’s timing right? Well we were sitting at my grandma’s one day and she pulls out a huge lunchbox full of food. She had a pantry of food in that lunchbox. Fruits, veggies, water, crackers, and chicken. She tells me a great way to lose weight is to use Tupperware to prepare, and something for me just clicked. We all have our FAT excuse. Why are you fat? I don’t have time to exercise. I can’t get motivated. I don’t like “diet” food. I can’t afford to eat healthy. Healthy food is so expensive, and on and on with excuses. My excuse was that I don’t have time to cook. I have a full time job, a house to maintain, a kid (enough said), and a boyfriend who wouldn’t eat “diet” food if he was starving. I don’t have time to prepare their food and diet food for me. Boloney. Anybody else have Justin Timberlake’s “Cry Me a River” stuck in their head now? I don’t speak for everyone when I say this, but I was comfortable being fat and I was too lazy to change. And you know, I was really ignoring just how big I was. Tupperware (PREPARATION) was my answer. Use Tupperware to separate a go-to meal for the rest of the week. Use Tupperware to store your fruit and/or veggies and make it ready to grab. Having fruit and veggies already cut up and waiting in the fridge made food readily available when I wanted a snack. I used to waste so much food, fruit especially, because I was too tired or hungry to take the time to cut fruit up and I would go for a bad snack instead. Then fruit went bad and into the trash uneaten. As fruits and veggies are ZERO points, you can eat as much of them as you want so make sure these foods are readily available. Use Tupperware to help you with portion control. Because Weight Watchers does not count calories, but points, options of what you can eat are limitless, but portion control is the key. Want a slice of cake? Ok but don’t eat the whole cake. Common sense, but it needs to be said. And when I say portion control, I don’t mean the portion you want. Check the serving size for anything you eat. If the cereal you want has 1 cup for a serving size, pour 1 cup of cereal into a measuring cup before you put it in your bowl. Adding fruit? Put the fruit in the bowl first and then add the cereal. I recommend buying a food scale. You can buy a food scale at Walmart for around $15-20. These measuring scales are awesome because you can put the bowl on the scale, zero it out so the bowl’s weight does not factor, and then add cereal. No measuring cup needed. This measuring scale can be used for any foods, even liquids since you can zero out the cup or bowl holding it. See Walmart for an example. It is important to learn portion control. If you do not pay attention to the serving sizes then you still are not paying attention to what you are eating. You are also eating extra calories or points that you are not keeping track of. Use Tupperware (or baggies) to prepare your snacks. Do not grab a bag or box of anything and just start eating from it. Whatever you are eating, count out the serving size amount, put it in a bowl then eat it. Do not take the entire box and eat it on the couch while watching TV because you are not paying attention to your food and before long you eat the entire box. Not paying attention to what we eat got us here in the first place! Solution: Grab your snack food, crackers, chips, pretzels, whatever, and count out your snack. 24 Kellogg wheat crackers are 3 points. Put 24 crackers in baggies or Tupperware and set it aside for when you are hungry. By using this method of portioning your food, you will be SEEING your food. If you are a visual person, put your snack in a small bowl or a small baggy if it makes you feel like you are eating more. You will lose weight by doing this because when you pay attention to your food you are also paying attention to when you are full! When you notice you are full you will stop eating instead of noticing only when there is no food left to grab when you put your hand in the bag and you realize you ate it all! So that is my advice for Tupperware. I say Tupperware, but it is actually preparation. You are setting yourself up for success if you plan your food. It makes it easier to stick with a plan when you have your food ready to grab like all the other not so healthy stuff in your kitchen. Months into Weight Watchers, I still occasionally use Tupperware for my meals. I always do it for my fruit. 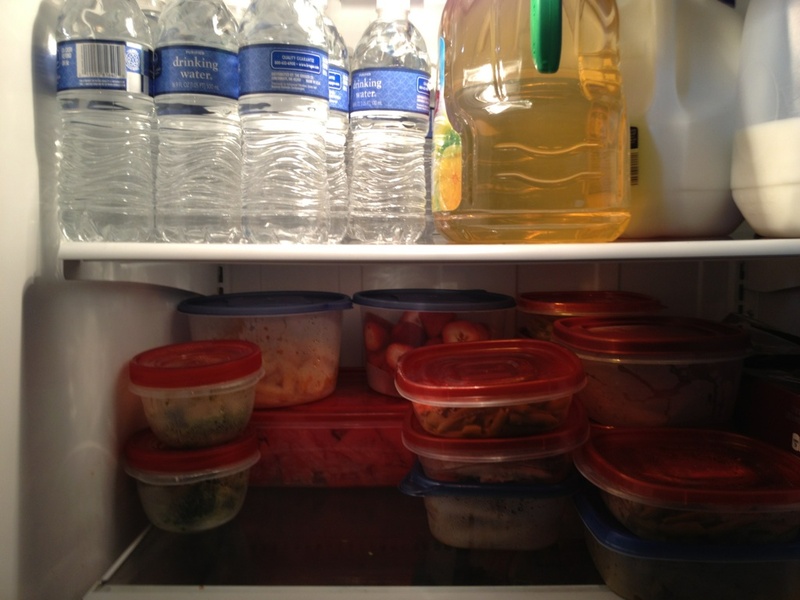 Using Tupperware was a great help to me when I started because it got me into a routine. I became aware of my food and portion sizes. It gave me time to lose weight so I could see it was working, thus motivating me more. It also allowed me time to find healthier recipes for the same foods I’ve always eaten (spaghetti, meatloaf, chicken noodles, etc.). In doing so I was making healthier meals for my family. I stray back to using Tupperware when I find myself eating out too much and it gets me back on the wagon. If you find yourself in a rut, straying back to bad foods, or if you are busy and eat fast food a lot, try using Tupperware. For those of you out of the house a lot, pack a lunch box and use Tupperware. Even if you do not have access to a microwave, you can pack fruit, granola bars, water, and sandwiches. By preparing, you are giving yourself healthier choices and reducing the temptation to eat whatever you can grab first.